Monday was the first Pioneer Day that I’ve been able to celebrate in Utah for many years. I started the day in a traditional way — by attending the Days of ’47 Parade in Salt Lake City. After a break, I ambled over to Beer Bar for a tradition that sprung up in the years when I was outside of Utah — Pie and Beer Day. It’s a bit silly but Beer Bar was hosting a fundraiser for the Utah Brewers Guild that featured pairings of pie with local craft beer. The offer was five pairings for $25. It was a little pricy, but it allowed me to try a lot of different pies and beers that I wouldn’t ordinarily seek out. It was a big draw as the establishment was packed with people, both inside the building and outside on the rear parking lot. As I fought the crowds, I took notes on the beverages and desserts that I ate. The pie: Lamb sausage pie with goat cheese, pickled peppers, caramelized fennel, herbs and park fat crust. Tasting notes: The beer is relatively light for an IPA. The hops come through, but the pine accent is primary note. The pie is savory as expected, but the herbs and fennel make themselves known. The crest by itself is flaky, and is serviceable as a pie delivery system. It’s a bit greasy (which is understandable given that it’s a pork fat crust) but the crest ultimately holds up. Combining bites with the beer, they go well together – the body of the beer stands up to the boldness of the pie without conflicting with each other. Mormon Funeral Potato Pie from Garage on Beck & amber steam lager from Moab Brewing. Tasting notes: Despite spending a few years in Utah, I really don’t have much experience with “funeral potatoes” — a common fare for gatherings around funerals. I am more familiar with the steam lager style of beer — an older brewing style kept alive in part because Anchor Brewing of San Francisco continued brewing it during the dark ages between the Prohibition and the beginning of the craft brewing era. The beer is a bit sweet with a tinge of bitter hoppiness. It’s got an amber color and definitely tastes like an amber (actually, it may be an amber — I’ll have to double check [Edited to add: It was amber and a steam lager.]). The top of the pie doesn’t look like I would expect it to — it’s got a dry, crumbly look with bread crumbs and what looks and sort of tastes like dried shredded cheese. The inner part of the pie looks more like a potato casserole should. The crust is very crisp and has good flavor, although it’s not as golden brown as it could be. The pie is spicy, which compliments the creaminess of the potatoes. Digging into the pie is a bit of an ordeal because the dry toppings go flying to and fro but there’s some sort of chewy middle layer that doesn’t let go easily. As far as a pairing, it’s another winner in my book. Blueberry Lemon Hand Pie from Tulie Bakery & Tart and Juicy from Epic Brewing. Tasting notes: There are a lot of cute little pies at this event. I skipped all of them and went for the monster hand pie by Tulie. It looks like a triangle of folded puff pastry topped with sugar and toasted golden brown. Given the size, I’m a little worried that the balance between pastry and filling may be off, but we’ll have to see. The beer isn’t one that I would seek out on my own, except to maybe try once or twice. It’s got a ruddy orange look and definitely has a tart scent. On tasting, it’s lighter than my first two samples. It starts off with a bitter fruit taste but then it opens to a more balanced sweet and tartness. The pasty is slightly overbaked, with an overly dark underside but it isn’t burnt. The crust is flaky, buttery and falls all over the place (likely because it’s dry). The fruit is there, but the flavor of the pasty is dominant (especially on the edges and this hand pie has a lot of edge). The blueberries are present, but I’m not getting much lemon. There’s also a flowery accent which is pleasant. As a pairing, the sourness of the beer doesn’t fully match up with the pie as the beer underscores the pie’s lack of sour or tart bite. Unfortunately, I’m going to have to score this as a miss. Apocalypse Now Pie from Beltex Meats & “mystery beer” from Bohemian Brewery. Tasting notes: This entry had the most intrigue, given that the pie had a vague description and the beer was unspecified. However, Beltex has garnered a reputation for being good with meat, so I had high hopes — something that was borne out by others who had previously sampled the establishment’s offering. Many had high praise, although one noted that it was a little dry. The beer is slightly sweet with just a hint of a hop profile. It tastes like a competent lager, but I worry about it being overwhelmed by the pie, which features rich beef, pork confit, kimchee and cheese — all savory elements. The pie is a round handpie, with fork-crimp edges and a shiny golden brown finish. There’s no indication of what’s inside, but the initial appearance makes you want to dive in. Working in the from the tough edges, my first impression was mostly American cheese, which was just OK. The second and third bites were better. The pork confit is definitely present as there was a hunk of shredded meat in my pie. I don’t think the kimchee entirely worked — it adds a bit of color and spice, but it gets lost in everything else. The hashbrowns are stringy, but that’s probably for the best because it allows it to spread through the pie without being overwhelming. The cheese was odd — part of it backed to the upper crest and turned an unpleasantly dark brown. The crust itself is dry when it’s thick — which may have prompted the comment about dryness. When the crust is acting as the envelope for the pie filling, it seems to be just right. Overall, I would say this is a solid hit, but not a home run. The beer actually works with the pie, to my surprise, as the lager lost none of its flavor potency. I joked with one of the Beltex people about what they’re going to do next year. I suggested Apocalypse Now Redux or Heart of Darkness. Now, that I’ve had time to think, I would be in favor of Tart of Darkness. Pecan pie made with Breakthrough wort from Stein Eriksen Lodge. I had saved the pecan pie from Stein Eriksen Lodge for last, which turned out to be a bittersweet decision. The pie was supposed to be paired with Park City Brew’s Breaking Trail Pale Ale, but they ran out. The good news is that the pie didn’t count as a pairing (essentially a bonus). As an aside, Beltex also appeared to be out of beer and their pies weren’t visible, so it was good when I grabbed the pie when I did. The pie: Pecan pie made with Breakthrough wort. The beer: None 🙁 (although the pie people noted that the sweet barley wort created as part of the brewing process was used in the pie). Tasting notes: The pie looks great, with chopped pecans throughout the filling. Some pecan pies have just a handful of nuts. This is the total opposite. The crust looks like it’s in good balance to the rest of the pie — not overly thick, with a light golden touch. On first bite, the flavor of the pecans comes to the fore. There’s a little sweetness to it, but it’s not overwhelming as some pecan pies can be. The pie is a little on the drier side, without as much of the cohesive filling but it holds up well. I’m not getting much crust on my bites, but that’s not the worst thing in the world (and it may be balancing out the nuttiness of the pecans). This is definitely a good pie. Rhubarb pie from Pat’s BBQ & Blueberry Hefeweizen from Squatters Beers. Tasting notes: My phone battery is dying, so I’ll keep this one short. The hefe has the blueberry notes. It smells fairly tart but the delivery is entirely smooth and sweet. There’s almost a cream taste to it. The rhubarb is a mix of rhubarb and blueberries. They go great together — tart and sweet. The crust has absorbed some of the moisture of the filling, but that’s not bad for pie. The crust is still firm. Tasted together, the pie and beer are fruit whammy. Not a bad way to finish my first Pie and Beer Day. At the end of May, I marked the first anniversary of my returning to Utah. To celebrate the occasion, I reviewed the photos I took from the past 365 days and picked ten that highlighted some of the fun activities from 2016-17. There’s also a bonus picture — the first photo I took upon my return. A view of the Wasatch Front from downtown Provo. It’s the first picture I took on my first day of work at the Daily Herald on May 26, 2017. Looking toward Ogden’s 25th Street from Ogden Union Station on June 28, 2016. It was part of a great day exploring the city and the former train station (now home to several museums). The Daily Herald offices moved to downtown Provo just days before my arrival. One of the highlights is having a third-story view of University Avenue, particularly on days like the Fourth of July. Here’s a shot of the Freedom Festival Grand Parade on July 4, 2016. Provo was among the cities that went crazy for the “Pokemon Go” craze last summer. It was fascinating to see the crowd outside the Provo City Library at 1:32 a.m. on July 10, 2016. Provo lost two of its icons on Sunday, Aug. 21, 2016. After watching the demolition of the Provo Power smokestacks, officials escorted the media around the site. My first time inside the Vivint Smart Home Arena wasn’t for a Utah Jazz game, it was for the first day of Salt Lake Comic Con 2016 on Thursday, Sept. 1, 2016. Thousands of “Star Wars” fans were on their feet for the arrival of actor Mark Hamill. After seeing Mark Hamill at Salt Lake Comic Con, I booked it over to Pioneer Park for the Twilight Concert Series. I worked my way through the crowd to listen to Trombone Shorty & Orleans Avenue. The concert was a lot of fun, but I was pretty tired by the time headliners Fitz and The Tantrums made their way on stage. By that point, the sun had set and I found my way to a grassy area to sit down. Although I now work most nights, I still get out for karaoke nights. After trying a few places, I’ve settled in at The Tavernacle in downtown Salt Lake. The bar frequently features dueling piano players, but turns it over for karaoke on Sundays, Mondays and Tuesdays — including Tuesday, Nov. 15, 2016. One event I was excited to participate in was the Sundance Film Festival. It was two weeks long, but my schedule really only accommodated Tuesday, Jan. 24, 2017. I still made the most of it, including catching three screenings and walking around downtown Park City (after most of the places had closed for the evening). Another highlight of the last year has been visiting venues used in the 2002 Winter Olympic Games. It inspired me to make my way to Soldier Hollow for a day of cross-country skiing lessons on Tuesday, Feb. 28, 2017. It was far too easy for me to overexert myself (and I fell into a stream), but it was a lot of fun and very rewarding. Another rewarding activity was curling at the Utah Olympic Oval in Kearns. After taking a couple of lessons, I joined the Monday league for the fall and winter sessions. I got a lot of practice in and really got to enjoy the sport. I even helped win a match with this shot on March 6, 2017. My profile on Google Maps. Just a year ago, I passed 2 million views on Google Maps. Imagine my surprise when my images surged past 10 million views just a couple of months ago. The 190 images I’ve published on Google Maps has been viewed 11.1 million times as of this writing. I wish I could claim total responsibility for this accomplishment, but it seems like it’s more a matter of being in the right place at the right time. Since I started uploading photospheres to Google Street View, none of them had exceeded 1 million views (although one was close at 970,000 views). Following the Oroville Dam crisis in February, I had two photospheres reach past the one million mark, with one reaching past two million. In my experience, the most successful spheres are those that are featured in Google’s search results. I don’t have definitive proof that this is the case, but I’ve found the images that featured in the search results seem to perform best. The example that came to mind was my photosphere for Bear Hole in Bidwell Park. I was surprised when I saw it suddenly surge beyond 100,000 views. I wasn’t sure why it was performing so well. The most plausible explanation was that it was featured on the search results on Google Map. When I searched for Chico, CA in Google Maps, the search engine returns a map of the city, but there’s also a card showing useful information — and photos of the city. Often times, these are popular pics of major landmarks or the like. Google also includes photospheres. This is often from its own Street View service, but it increasingly appears to include photospheres taken by its users. A Google Maps card for Oroville, California on Monday, May 29, 2017. The top image is from one of my photospheres. I think this is behind my most “popular” photospheres, including ones taken at regional parks, train stations or other landmarks likely to be searched by people. That brings me to the incident that brought my views surging to new heights. In early February, there was a natural disaster that prompted the evacuation of more than 200,000 people in Northern California. Although the emergency spillway at Oroville Dam didn’t breach, I imagine there were a lot of people interested in learning the location of Oroville Dam and the surrounding area. Indeed, the most popular photospheres featured the now-destroyed main spillway at the dam. It’s interesting that my most popular image is something that no longer exists. The second most popular image for me was a photosphere of sculptures at Centennial Park in Oroville. It’s not associated with the park because there’s no entry for the park on Google Maps, but it is the first thing that comes up on Google Maps when someone searches for Oroville. Several other images from Oroville have jumped following the Oroville Dam crisis, but those are by far the most popular. I don’t know if a view is counted merely because someone sees it on a search result or if someone actually clicked through to see the full image. I would like to think it’s the later, but information on Google support forums indicates that merely seeing an image in a search result counts as a view. Ultimately, I would like to think that people are viewing my images — it’s nice to think that millions of people are seeing my work. If it’s true, these images are the most popular thing that I’ve ever done. 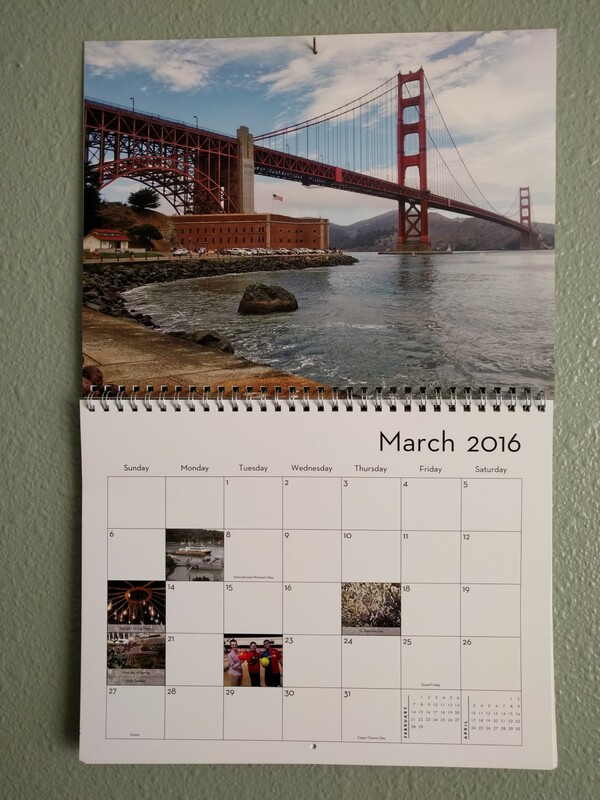 A custom-made calendar for March 2016. There’s a gag I do every so often in the spring where I include the number of days since a specific life moment happened. Of course, every year that I do it (which isn’t every year), I have to add 365 or 366 days to the tally. This year, I realized that I was going to hit 5,000 days. It was bit shocking that so much time has passed since this original milestone in this facet of my life. At the same time, it is just _one_ element of my ongoing experience. It’s not something I can be fixated on because it ultimately isn’t very productive — it is what it is. Although we scarcely need another reminder that time is fleeting, the milestone offers a bit of perspective especially because I certainly don’t want another 5,000 days to go by. I’ve made some steps to change the situation, but I haven’t been very successful (and if I’m being honest with myself, I could’ve certainly worked harder at this conundrum). I think about the person I was those many years ago. I hope I’ve changed for the better since then, but I know there are many areas where I can improve. Hopefully, this will all add up to something … someday. UCSD’s Main Gym is seen in this composite photo taken in the 1990s. Most indoor intercollegiate activities now take place at the RIMAC Center. The UC San Diego intercollegiate athletics program faces a key date this month, as the Big West Conference leadership is supposed to consider whether to invite UCSD into the conference (and thus determine whether the campus moves to NCAA Division I, per the outcome of last year’s student vote). I’ve been paying more attention to the matter, including visiting a number of discussion boards centered around the Big West and other mid-major conferences. I spotted the above quote on one of the boards and wanted to respond because that information doesn’t match what I’ve seen. I’m also including some additional thoughts that have been on my mind. UCSD men’s basketball average attendance has been several times higher than this figure in the past. It’s not going to compare with the top-flight Big West programs, but it’s better than the cited members. It beat the average NCAA Division II men’s basketball attendance ​of 710 per game in 2014. As a D-II program, UCSD also exceeded UC Riverside’s average attendance that year (762) and non-BWC Sacramento State’s (815). It also tied CSU Northridge that year in the category. Of course, UCSD’s figures reflect average home attendance over the entirety of the season (which was the standard that the original poster offered). Spirit Night attendance in 2015 was 3,881. If one wished to calculate the average WITHOUT the most popular game of the year, you get a per-game average of 562 — still twice the figure originally offered. As an aside, UCSD women’s basketball average home attendance in 2014-15 (397) beat out UC Riverside (270) and UC Irvine (248). UC Davis had a respectable 1,049 while non-BWC San Diego State had a relatively woeful 604 (non-BWC University of San Diego also had 536). I know a lot of attention is focused on the men’s basketball teams, but a single sport does not an athletic program make. According to 2014 numbers (which may be the 2013-14 season, my notes are incomplete), UCSD men’s basketball had higher average attendance than 21 D-I schools (out of 345). The women’s team outdrew 31 D-I schools (out of 343). Regarding the men’s basketball attendance figures, I did the initial research in part to show that moving to Division I isn’t a silver bullet for schools moving up. As a UCSD graduate watching UC Riverside move to D-I in the late 1990s, I thought that they made the move for the wrong reasons and their still-woeful basketball attendance may an indication that they may have missed the mark. I’m still worried that UCSD students are seeking the move to D-I for the “wrong reasons” because merely moving up a division isn’t likely to deliver the supposed greater prestige of competition (no offense to BWC), higher alumni interest, boosted student spirit and increased relevance in a sports market that already includes two D-I schools and a MLB team. I’ve long backed an approach similar to UC Davis, which built up student and fan support years before moving to D-1. At the same time, as any proud Triton will tell you, UCSD is NOT UC Riverside. Even as a D-II program, UCSD men’s basketball home attendance tops lower-tier BWC teams. Although it’s not a guarantee, UCSD would hopefully continue to top those numbers and grow as it moves into D-I. Ultimately, I’m setting aside my personal reservations because UCSD students DID vote for the move and I pledged to back whatever the students decided (they’re paying for it, after all, and will reap the ultimate fruits of this endeavor). With the figurative ball now in the conference’s court, I appreciate the discussions on this board and elsewhere. There seem to be a lot of factors at play, but I hope there’s a decision that works best for everyone. * — Why figures from 2014-15? Those were the ones available when I was researching the issue ahead of the UCSD students’ D-I vote last year. 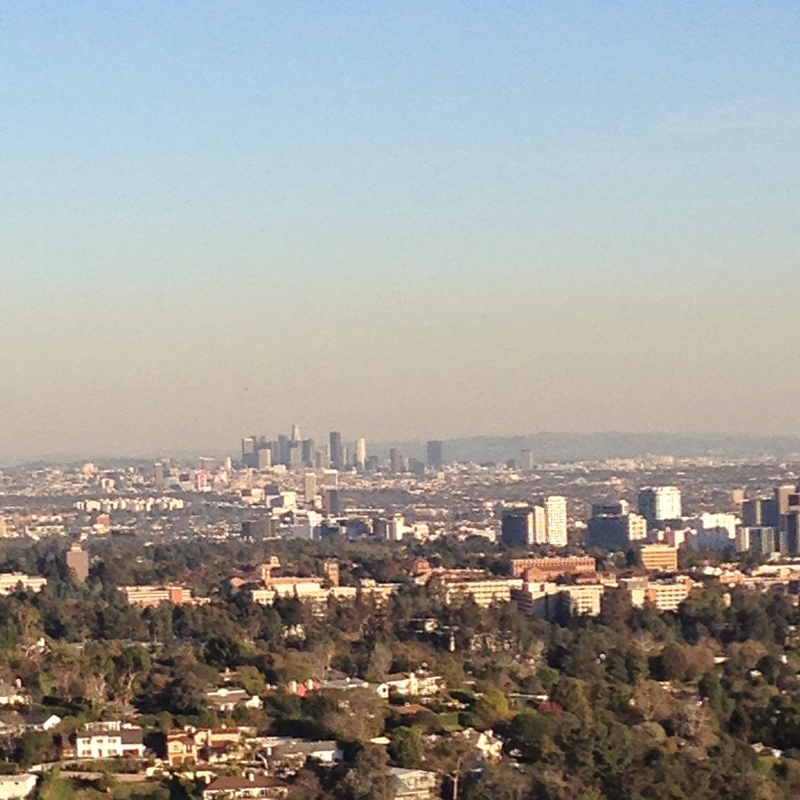 The Los Angeles skyline as seen from the Getty Center in December 2014. I’ve seen “La La Land” twice, so I think it’s safe for me to venture an opinion. It’s interesting that jazz plays such a interesting role in the film as one of the life passions that one of the lead characters pursues. If I were to compare “La La Land” to a jazz piece, I would say that there are some interesting themes, but the ensemble relies on the same beat too often. The film contains a lot of enjoyable elements, but it doesn’t necessarily gel — especially at the end, when such cohesion is needed. The film, being set in Los Angeles and providing several fun, brightly colored musical numbers, inevitably draws on artificial constructs of filmmaking. Unfortunately, writer and director Damien Chazelle seemed to lean on these constructs too often and it became distracting. For example, it’s not an uncommon staging technique (especially in theater) to isloate people by placing them in a spotlight and fading the lights around them. Although there are other ways to reproduce the same effect more naturally in cinema, it’s not a bad way help heighten an emotional moment. Unfortunately, repeating the technique about 10 times in a two-hour film greatly diminishes its impact and ultimately takes the viewer out of the story. It may be that Hollywood-centric stories generally draw from a general pool of cliches and expectations that other L.A. films have established, built upon and distorted over the decades. “La La Land” draws on these expectations, but doesn’t seem to exceed them. This was especially clear when Stone’s actress character is called into an audition reminded me of the end of “The Muppet Movie” where Kermit and the gang finally gain audience with a studio exec and sign “The standard rich and famous contract.” While Stone is winning in that scene, it doesn’t really go beyond ground tread by frogs and pigs about 40 years ago. Chazelle can have a deft hand behind the camera. That’s readily apparent in the showstopping opener, “Another Day of Sun,” which was shot in a single, flowing take over two rows of stopped cars on a Southern California highway interchange. The selection of shooting locations is also a fun trip around an idealized Los Angeles, including the Griffith Observatory and the currently closed, but fondly remembered Angels Flight funicular railroad. The energy of the opener and the subsequent song helping to establish the female lead lend the film a tremendous amount of energy. This energy seems to fade gradually as the film progresses into the story between Emma Stone’s Mia and Ryan Gosling’s Sebastian. Although music remains a present campanion through the film, if often takes a backseat to the drama of Mia and Sebastian’s courtship and the ultimate fate of the relationship. In the climax of the relationship storyline, music plays in the background until it suddenly stops on a critical beat of the dialogue. The song’s sudden silence adds a unique texture to the scene in a way that feels more natural than the camera blocking for the scene. The camerawork during these scene — an argument — plays up a common filmmaking technique. The scene starts with the two characters in the frame together — even when one character is speaking and facing the camera, the other character is still in the frame. This shifts as the argument builds tension. The couple stops sharing the frame as Chazelle isolates each character — helping to signify the growing distance in the relationship. I think it was a fascinating decision to show close-ups of Mia and Sebastian’s faces, allowing the emotions on each of the actors’ faces to unfold in grand scale. Ultimately, I don’t know how effective the scene is because of relying on a standard technique. I love that Chazelle deploys different camerawork depending on the scene, although I wonder if it wholly comes together. The final number, a medley sequence recounting the events of the film if they had gone differently, is exhiliarating. It makes a play for the viewer’s heart, but it didn’t quite work for me. It relies on there being a great love story at the core of the film and I don’t think that ever fully took root. There’s enough to “La La Land” to make me want to visit, but I’m not looking to stay. 3 stars out of four. As seen on Instagram, I debuted a new yellow UCSD T-shirt on Friday, Feb. 17, 2017, as the UC San Diego Tritons took on the Brigham Young University Cougars in Provo. I’ve been a pretty vocal opponent to the possibility of UC San Diego moving to Division I. Despite my past reservations about D-I (which seems highly likely at this point), it was a total blast to once more cheer on the UCSD Tritons in men’s volleyball tonight against Brigham Young University. This was a match I had been looking forward to ever since I moved to Provo last May — men’s volleyball is the only Triton team that regularly competes against a team in Utah. When I was in Chico, UCSD and Chico State were in the same conference, so there were always a couple of opportunities every year to cheer for the blue and gold in sports like basketball, baseball, softball and women’s volleyball. Although I hoped to be loudly cheering for the Tritons on Friday, I knew that there would be a lot more people rooting for the Cougars. Watching some past volleyball matches on BYUtv, I knew that the Smith Fieldhouse can be a loud atmosphere but I wanted UCSD to have a voice there as well. I also bought a new, bright yellow Triton T-shirt for the occasion. All of my previous shirts were shades of blue, which would probably blend in with the Cougar blue that was sure to fill the stands. When it came to buying the tickets earlier this week, I was a bit at a loss — I didn’t know if there would be any Triton supporters in attendance and where they might sit (and the reserved seats weren’t necessarily cheap). The box office staff at the Marriott Center was friendly, but they didn’t know either. Eventually, I just settled for the $5 general admission ticket and decided to take my chances. On game day, I donned my new shirt and made my way north to the BYU campus. Parking was super-easy as the expansive fieldhouse lot is available to the public after 4 p.m. or so. The fieldhouse itself was a quirky older building, with a narrow indoor track ringing the court and seating area. I made my way past the clearly reserved seats to the opposite side of the court. I asked a man handing out programs if this where the general admission seats were. He said yes and commented that I was brave wearing that shirt inside the fieldhouse. As I made my way into the arena, I saw blue, plastic hard-backed bucket seats. The aisle seats were all marked “reserved,” and I assumed that only _those_ seats were reserved. That was an erroneous assumption, but I wouldn’t find out about that until later. I found a great seat about five or six rows up near center court (but not on the center line because it had the “reserved” sign on it). I picked the side that I knew the Tritons would be on and settled in. I noted that the playing area on the court was smaller than it looks on TV. I’ve attended dozens of volleyball games, so I’m used to the court dimensions but the difference in perspective was fascinating. It was about 30 minutes before the start of the match, so I took a self-portrait to post online. I also dashed to the concessions stand for a couple of waters because I knew it was unlikely that I would be able to leave my seat once the match began (a prediction that generally proved correct). The crowd slowly trickled in. I looked about several times to see if there were any other Triton fans in attendance, but I wasn’t having much luck. All too quickly, the countdown clock wound down and it was time for the match to begin. After singing “The Star-Spangled Banner” along with the crowd over a very loud recorded instrumental version of the song, it was game time. Writing in a journal at the Chipotle on Mangrove Avenue in Chico. I’m trying something new on my blogs. For years, I haven’t done a great job of keeping things up to date, letting months go by between updates. It’s not that I haven’t had anything to say. I have had plenty of things to write about — and now’s the time to write about them. Starting today, I’m launching a daily item called The20. Every day, I want to set aside 20 minutes to write anything on any topic that catches my fancy. It could be a review of a TV show or move that I’ve seen recently, it could be some thoughts on the weather outside, recapping some recent adventures or taking a deep dive back into some events that I would enjoy recounting. To maintain impartiality and professionalism, I’ll stay away from politics. As you can tell, the topics will be pretty random, but I hope it will be enjoyable. I know it will be for me (and I seem to be the primary reader on these sites). A while ago, I re-read some old blog posts I wrote about karaoke when I first moved to Chico in 2005. They’re nothing earth-shattering and they didn’t follow the time limits I’m proposing for this column, but it was interesting to review my brief chronicles of an activity that I still have a lot of fun doing. That’s the other component of The20 — it will contain everything I write in 20 minutes. It will be interesting to get a sense of how much I can write within the time limit. I may break some topics or subjects into multiple part essays to help bridge them over multiple days. There are journeys that I’ve taken or moments in my life that I don’t think can fit into a single, 20-minute chunk. While I’m worried that I won’t be able to get everything out in 20 minutes, the opposite may be true. After 15 minutes today, I’m finding that I’ve written most of what I want to say on this subject and I’m largely just editing my post at this point. None of these are going to be hard and fast rules — I’ll probably do some editing and adding photos after time is called. There will also be some topics where I will go long (Monday’s essay on Lake Oroville is an example). I’m excited about this new project. Everyday, I spend so much time away from work just randomly reading websites or watching TV. I eventually reach a point where I feel I’ve read or seen everything I care to for a day. It will be nice to focus some of this energy on actually creating something. There are a lot of things I’d like to share with others, but I need a plan. Although I can be slow to pick up the pen or start typing, I can get totally engrossed in the process. A view of the Oroville Dam emergency spillway from the Spillway boat launch in March 2016. In February 2017, much of the area was underwater as the emergency spillway was used for the first time in the dam’s 48-year history. My thoughts are with everyone who has been affected by the crisis at Oroville Dam, which led to the evacuation of around 200,000 people living downstream Sunday out of fear of a collapse of the emergency spillway. I can’t fault Butte County Sheriff Kory Honea for his decision to call for the evacuation Sunday. I don’t have all the facts, but it sounded like things were on the verge of disaster and calling for residents to leave the area seems like a sensible precaution when lives are at stake. The region has had devasating floods in the past, which led to the construction of the dam complex in the first place (that and suppling water to downstate users). While there should be some hard looks at the decisions that helped lead to this crisis, it’s unfortunate that a full Lake Oroville has turned into calamity. It’s the exact opposite of just three years ago when a half-full lake was used as the representation of California’s prolonged drought. It wasn’t a pretty picture at the lake three years ago, which ironically made it a tempting image for photographers and TV news reports. At the drought’s low point (pun intended), all but one of the lake’s boat ramps were out of water and marinas had to remove houseboats because of the dwindling lake surface area. The lake looked like a giant, half-filled bathtub with the exposed shoreline looking like a red-colored ring. I remember last spring, when a good water year helped fill the dam to near capacity. I stood on the trail overlooking the spillway as water flowed down it for the first time in years. People I spoke with then were so elated to see the spillway open and the prospect of the lake filling to capacity (it didn’t in 2016, but it came close). I was personally awestruck when I calculated how much water was flowing down the channel, even though it looked so abstract at a distance. That picture’s totally different today. The force of water took on a new, fear-raising aspect last week as we contemplated pictures and video of the concrete spillway being critically damaged. As the lake reached new heights, concerns did too as the lake hit the emergency spillway level of 601 feet above sea level for the first time ever over the weekend. Considering the damage that’s been done to the concrete spillway, I think it’s understandable that something catastrophic could happen to the emergency one. I don’t know how much water would be released in that situation — it wouldn’t be as much as a dam failure, but it would still be pretty bad. Even a two-foot elevation change could suddenly release about 10 billion gallons of water in the downstream Feather River. As of last night, the state Department of Water Resources was working to lower the lake by about 50 feet. As the lake lowers about a foot every three hours, it will hopefully reach the 850-foot threshold before a new storm hits the area in a few days. Still, I wonder if that’s enough. The DWR’s ability to remove water has been critically compromised by the problems with the two spillways. Even as the pressure on the emergency spillway is reduced with the lowering lake level, I don’t know if officials and the public should count on it until some serious inspections and repairs are made. I think officials should keep lake water pressure off the emergency spillway structure AND maintain enough flood control buffer space (which one document I saw stated was 750,000 acre-feet, although I think that figure actually varies based on the time of year). To accomplish both, I think the lake level should be lowered even futher — to about 788 feet above sea level. That’s based on the current drawdown to 850 feet, plus the 750,000 acre-feet of flood control buffer. Such a move would leave the lake about 58.2 percent full (with 2.06 million acre-feet of water stored), at least until the end of the season when the flood control isn’t needed anymore. It’s unfortunate that we should have to lower the lake level after years of wishing for a full lake. However, this recent storm showed the inadequacy of the current, impaired control system. Lake Oroville has already seen two periods this year where water levels surged dramatically. If we want local residents to be safe in their homes in the event of a third surge, the lake level should be dropped to a threshold that offers the most safety without risking further damage to the emergency spillway. After shooting around Chico for my first five cards, I went all out for the 2013 Christmas card and ended up with what is probably the most beautiful of the cards that I’ve shot so far. After years of joking about doing a Sierra Nevada Santa Claus — where jolly Ol’ St. Nick enjoys a local brew similar to the iconic Coca-Cola ads — I finally came up with a workable solution. I always had a number of reservations about the Sierra Nevada Santa, including the fact that I don’t want to encourage drinking and sleighing. I also didn’t necessarily want to go to the expense and effort of renting a Santa costume, especially because I had doubts that I could pull off a convincing Santa. After some consideration, I thought that I could build a snowman wearing a Sierra Nevada shirt. I always strive for a PG-rated card and the shirt in of itself is fairly innocuous. I would also need to go to a location where there was snow and my first thought was of Lake Tahoe. I’d never been to Lake Tahoe before and I was excited to check it out while shooting my card. Although I’ve always maintained that one of my goals was to create Chico-oriented cards, I made an exception because it doesn’t really snow in Chico and that I was remaining in Northern California. As time passed, I worried about being able to get to the picturesque lake in time. After hearing of snow in foothills and Sierra Nevada, I decided to try a location closer to home up Feather River Canyon on Dec. 8. It was a total bust. After driving up Highway 70 along the winding Feather River, I made it to Quincy. My hopes were buoyed by the fact that the snow cover increased as I headed further uphill. I sought an open field to build the snowman and picked Feather River College just outside of town. The snow didn’t clump very well and it was impossible to build a firm enough snowball to form the nucleus of the snowman. After a few minutes of trying, I gave up and retreated down the hill back to Chico frustrated but happy that I had enough time to pursue alternatives. The alternative came up quickly. I realized I could use my California Rail Pass that I would buy to travel to San Diego for the transportation to South Lake Tahoe. The Rail Pass was a great value — for $159, a passenger can travel to destinations within California on any seven days during a 21-day period (with several conditions). Although Amtrak doesn’t have a train that goes to Lake Tahoe, it has a motorcoach that makes the connection from Sacramento. Leaving Davis Station in December 2013. On Dec. 14, I made the trip to South Lake Tahoe via Davis and Sacramento. I was bundled for the cold, but it was a gorgeous sunny day. I primarily slept on the bus as it traveled on Highway 50, which was probably for the best because it is a very windy road up to Tahoe. When I arrived in South Lake Tahoe, I was a little bummed out that the buildings were a little dowdy. I had pictured either a quaint downtown with classic old buildings or picturesque mountain village. What I saw was neither — much of the construction was simple, modern boxy construction. Adjusting my expectations appropriately, I consulted with a map at the visitor’s center to look for an open field that would help provide an appropriate view of the mountains that ring the lake. Seeing a place that I could work, I walked a short distance to Rabe Meadow. The meadow was perfect. There were houses nearby, but the meadow presented an open field with near-pristine snow with either stands of trees or the mountains themselves as possible backgrounds. After picking an ideal spot, I set to build the snowman. It went far easier than before and I was able to quickly build the three spheres that would comprise my model. When it came time to put the Celebration Ale shirt over the snowman, I quickly realized that its torso was too big. Because I was working with snow, I used my gloved hands to hack away at the snowman’s torso until it was just broad enough for the shirt to fit comfortably. As some of the photos show, the lower part of the snowman is disproportional to the rest of the snowman but I generally refrained from photographing the snowman’s whole body. After putting on the T-shirt, I wrapped a scarf around the snowman to add further character to the creature. For his face, I used a handful of stones that I’d gathered outside my apartment in Chico. Once he was decorated, I think he resembled an Ewok or perhaps a stuffed teddy bear I had as a child. Getting everything set up went fairly quickly and I was able to take dozens of photos of the snowman from different angles and distances. It was tricky because I wanted to adequately capture the background in addition to featuring the snowman prominently while showing the Sierra Nevada T-shirt. It was a positive that I could rotate the snowman to capture different backgrounds. I tried to shoot pictures with the mountains stretching across the horizon and others with a stand of trees extending into the background. Complicating things was trying to capture the scene without having odd objects in the background intruding on the snowman at weird angles. It was also warmer than I had expected and the snow was melting. That ordinarily wouldn’t be too big of a problem, but the water was starting to soak the T-shirt which showed up on a few shots and the rock eyes began to fall from the snowman’s face. (It turned out that it was best that I shot photos on that day because there was no additional snow that month amid the ongoing drought). Generally, the photography went well with terrific early winter sunlight. A passerby was nice enough to take a photo of me with my creation. The Sierra Nevada Snowman and me. After finishing the shoot, I was able to enjoy walking around South Lake Tahoe. I had booked a room overnight, so I had plenty of time to walk out to the beach and then head back toward town for some food, libations and entertainment before calling it a night. It was definitely a great trip and I felt that I had a great card on my hands. When I returned to Chico, I had the challenge of finding the right photo and creating the best possible card. I went through the dozens of photos and picked the two or three that I felt best captured the moment. I generally liked a photo where the snowman was in front of the mountains with the blue sky in the background. However, I ultimately preferred a picture with the snowman in front of the stand of trees because I like how the evergreens contrasted with the white snow and red T-shirt. Thumbnails of possible 2013 cards. I definitely liked the iPhoto designs better than the Costco ones, but it was tricky to adapt a template set for one perspective to Costco’s 6 inches by 7.5 inches. I also wanted to feature as much of the photo as possible and the iPhoto templates generally didn’t do that … except for one. I ultimately went with a simple green banner across the bottom featuring the message “May Every Occasion Call For Celebration.” It was easiest to adapt for the Costco print sizes and definitely put the picture front and center. Ultimately, this was one of the most fun Christmas cards to make. It’s probably the best and most beautiful card I’ve created too, although I would definitely try to keep the standard high in the years to come. 278 — miles traveled for the 2013 card (83 miles to Quincy for the initial failed attempt and 195 miles via bus to South Lake Tahoe). 11 — Days before Christmas when I did principal photography. 127 — Principal photos for the card (out of 211 pictures shot during my two trips).